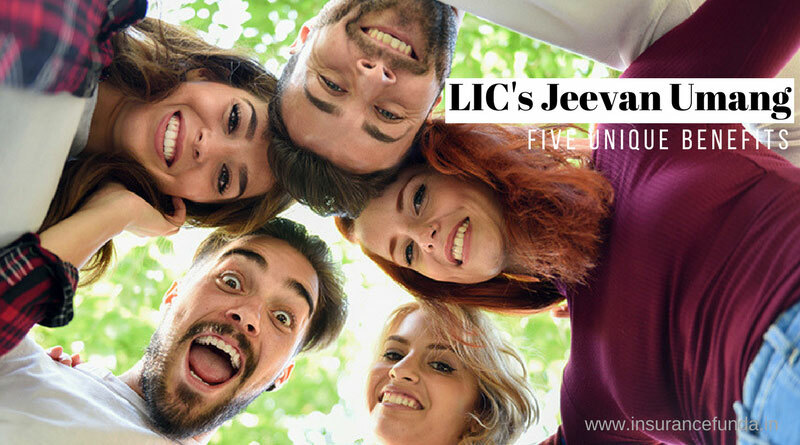 Five Great Features of LIC Jeevan Umang (Plan 845) – which you may not know. LIC’s Jeevan Umang is a versatile power packed plan form LIC of India, with some special features which provides some unique advantages from customers point of view. Before going into the special features of the plan, let us understand the general features. LIC Jeevan Umang T-845 – General features. Jeevan Umang can be considered as a unique insurance plan from LIC of India, owing to certain special features. These special features of the plan are given below. Special Surrender value – Helping to make the term flexible as per your needs. Paid up Value Benefit – helpful if you have difficulty in paying full premium. Bonus accruing to the policy, through out the life. – Helping to increase risk cover every year till death. Critical Illness rider – Helping to tide over the high treatment cost of major illnesses. Let us have a detailed look at the special features of the plan. 1. Special Surrender value – Helping to make the term flexible as per your needs. LIC’s Jeevan Umang (Plan 845) is a whole life plan with maturity at the age of 100 years of age of the life assured. At the time of maturity ‘Sum Assured + Bonus [B1 (Bonus during premium paying term) + B2 (Differential bonus after premium paying term)] + Final Additional Bonus’ will become payable. Even though it is desirable to have insurance coverage till the end of the life, many may not agree with this concept. People may need money for various reasons and may like to withdraw from the plan, any time after the premium paying period. Generally speaking, surrendering a policy brings loss to the customer, as only a percentage of the paid up value and the bonus available at the time of maturity is paid. But this is not the case with Jeevan Umang which is having Special Surrender Value applicable. (A) Special Surrender value after the premium paying term. In other words, it is the 90% of the claim available in the policy. Special Surrender Value is applicable to both fully paid (Premium paid for the full term) as well as paid up (Policies where premium is paid at least for three years) policies. *Please note that Final additional bonus will be considered for Special Surrender Value , only if the paid up Sum Assured is 2,00,000 or more. (B) Special Surrender value before the premium paying term is over. Special Surrender value applicable, when the policy is surrendered before the premium paying term, shall be, SSV Factor multiplied by the Sum of ‘Sum Assured and vested bonuses’. Special Surrender value shall depend on the premium paying term and the duration elapsed since commencement of policy. So Special Surrender Value applicable for the plan helps the policy holder to withdraw from the plan any time after premium payment with out risking his money. 2. Paid up Value Benefit – helpful if you have difficulty in paying full premium. Before going at depth into the paid up value benefit, let us understand what a paid up policy is. If at least three full years premiums have been paid and any subsequent premiums be not duly paid, the policy shall not be wholly void, but shall continue as a paid-up policy till the end of policy term. Paid up value of a policy can be calculated using the following formula. Paid up value benefit under LIC’s Jeevan Umang plan can be summarised as follows. If paid-up sum assured is equal to or more than Rs. 2,00,000, Survival benefits equal to 8% of maturity paid up sum assured shall be payable every year till 100 years of age as in a fully paid up policy, once the term is over. Further, the paid up policy will also participate in the future profits by accruing differential bonus (B2) declared by the corporation. This special feature enables the customer to get all the benefits of a fully paid up policy, even if the policy is lapsed and remaining as a paid up policy, subject to the condition that the paid up value of the policy is more than or equal to 2,00,000. One factor common to all pension plans (both immediate annuity as well as deferred annuity plans) is that the pension amount available is added to the income and is taxable. Even if the pension rate is reasonable, the tax charged on the pension lures the glitter of the plan. LIC’s Jeevan Umang (Plan 845) is having a special provision of paying annual survival benefits, guaranteed for life at the rate of 8% of which is in effect works as an annuity. As the amount paid is in the form of survival benefits, it is exempted from income tax u/s 10(10D) of income tax act. So if you want your pension to be tax free, Jeevan Umang is a good option to consider. 4. Bonus accruing to the policy through out the life. – Helping to increase risk cover every year till death. Many believe that insurance coverage is needed throughout life irrespective of the age and that is where the whole life plans become important. Popular whole life plans like New Jeevan Anand (Plan 815) have the provision of fixed risk coverage. In case of Jeevan Anand plan, if the person takes an insurance coverage of 10 Lakh sum Assured, life long coverage remains same 10 Lakh through out the life (After the maturity has been received). On the other hand, in Jeevan Umang plan, the policy continues to participate in the profit of the corporation even after the premium paying term is over. Bonus which is paid at a differential scale, shall get accrued to the policy, through out the life of the policy holder. The greatest effect of the accrued differential bonus is that the insurance coverage increases every year. 5. Critical Illness rider – Helping to tide over the high treatment cost of major illnesses. All the future plannings and prosperity of a family is largely dependant on one often ignored factor – health of the bread winner. Every body will agree that good health is required to earn. But often ignored factor is the expenses incurred to treat the illness and that too with reduced earnings. Situation becomes even worse if the affected disease is a major disease or in insurance terms Critical Illness. But the good news is that LIC’s New Critical Illness Benefit Rider can help you to reduce the financial burden, in case, the Life Assured is diagnosed as suffering from any of the pre-specified critical illnesses. This rider can be attached with LIC’s Jeevan Umang at the inception of the policy.